AppliTek’s starting point for each and every project is its analytical expertise. Through continuous innovation and field experience AppliTek is able to provide you the most advanced analyzer systems designed for 24/7 measurements in your process. As a solution provider, we offer also several services to complement the analytical part of our value proposition. AppliTek’s symbiosis between analytical expertise and system integration guarantees you a complete solution for a measuring problem, not merely an analyzer. AppliTek’s solutions are installed around the Globe, from arid, hot regions to arctic environments. All analytics are contained in AnaShell® shelters and cabinets made of chemically resistant materials, stainless steel or even concrete. AppliTek’s hydrogen analysis systems are in full operation at chemical plants worldwide and exemplary of our knowledge of delicate production processes, how to control them and prevent safety incidents or process failure. 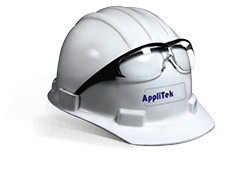 Deeply rooted into the process industry, AppliTek has extensive experience in a myriad of pretreatment techniques. We know how to handle and pretreat liquids, slurries, powders and gases, in accordance to your specs. AppliTek’s engineering department has dedicated teams of specialists and engineers for software, CAD drawings, Ex proof design, cost planning and, last but not least, commissioning on-site. Where necessary, AppliTek shares a joint strategy with local qualified companies for advice and support. These assist in start-up and commissioning of your project, while assuring a personal follow-up.